Northern Pacific 23720 is a Yarmouth Model Works kit. I really enjoyed building this car. Here’s the build summary, from a year ago. The model was painted with Vallejo Panzer Aces Shadows Flesh (343). The kit decals are produced by Black Cat Publishing, set #14689. The set can work for several NP box cars. I needed to edit a few parts in order to reflect mid-1920s lettering. It was great to have a couple of mid-1920s reweigh and repack dates on the set. These decals are delicate and work best with a puddle of distilled water on the model to position the decals. Once in place, carefully wick up the excess water with a paper towel corner. Let it dry a little bit before carefully brushing on a decal set solution so the film snuggles into place. Pittsburgh & Lake Erie 33246 is a Funaro & Camerlengo kit that was also built awhile back. This is a solid starter kit to get rolling in resin freight car kit building. The car was painted with Vallejo Acrylics, but the color was mixed on the fly. A box car red was the base shade and drops of yellow and black were added until things looked right. I now have a better brown color for a starting point. The decals supplied with the kit were not used. 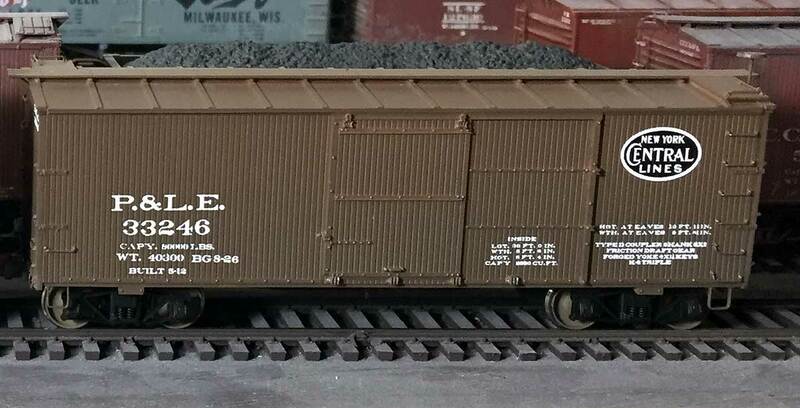 A friend has produced a few nice sets that can be used on these F&C New York Central 36-foot double-sheathed box cars. They are available through Resin Car Works as NYC001 and NYC002. There are lots of extras for other reweigh places and dates. Northern Pacific 38920 is another Funaro & Camerlengo kit that was also built months ago and featured here on the blog. This is another recommended kit for starting your resin freight car kit building. The model was also painted with Vallejo Panzer Aces Shadows Flesh (343). The decals provided with the kit were not used. While many F&C kits are of freight cars that were used in the Teens, 20s, and 30s, the decal sets reflect later lettering guidelines. I had an extra set of the Black Cat NP box car decals, set #14689, and put them to use. I was uncertain if the arced Northern Pacific lettering on the Black Cat set was proper for the shorter car, so two photos of NP cars were scaled to a similar size. One was a 40-foot car while the other was a 36-foot car. I noted no distinct difference between the arced lettering on each car. It looks tighter on the shorter car as there is less space, but the prototypes I reviewed seemed to use the same size lettering and arc. A couple pieces were used from other lettering sheets. The weight figure is from the F&C decal sheet while the Built and date, 36 Ft, and the Cubic Capacity info are all from a Rail Graphics generic data set. In many cases, you may need to mix and match from different decal sets to have the proper decal elements to reflect a prototype car. The Rail Graphics generic data sets are very nice and came in handy for this job. I know this won’t be the last time I use portions of the generic sets to make a model complete. It’s great to have three more decaled box cars join the Wheeling Freight Terminal fleet. Bit by bit the railroad looks more like a mid-1920s settting with appropriate freight cars. Beautiful work! And your attention to detail is very impressive, especially in regards to get the lettering just right…I have to confess, as a modeler of 1907, I often just resort to weathering my cars so that inappropriate dates are just difficult to make out!